I just want to take a moment to thank each and every one of you for your selfless efforts working with my campaign. The countless hours you spent supporting me through phone calls, emails, signs, walks, meet and greets, poll attendance, etc. are greatly appreciated! In a campaign like this, it's all about teamwork, and the way you came together for our cause was a display of teamwork at it's finest. In this 2010 campaign, the "A" in A-Team certainly stands for "All" of you! It has been an honor working with such wonderful, giving people. We took the high road in this campaign and your integrity is to be commended. I couldn't be more proud of you and I will always remember the sacrifices you've made! The fight is not over and when the next round begins, I hope that you will join me once again out on the front lines. Republicans should ignore the phony distinctions being tossed around about which candidate is more conservative. They should focus on who is able to tackle serious issues, from jobs and taxes to property insurance. Rep. Kevin Ambler has a stronger record of thinking on his own and conducting public business in a transparent way. Ambler, 49, a Tampa attorney, was a solidly conservative voice in his eight years representing the greater Carrollwood area in the Florida House. The former federal prosecutor and judge advocate for the Air Force has a good grasp of statewide policy. He has sensible proposals for cutting the size of government, targeting tax incentives to attract high-paying jobs and improving the quality of teachers. Ambler would subject property insurers to much more rigorous review before they could raise rates, a key concern for a district that is highly vulnerable to hurricane and sinkhole damage. Jim Norman, 56, has served on the Hillsborough County Commission for 18 years, where his causes were parks and youth sports .Norman started out as a moderate voice. But he later championed the interests of developers. Norman was slow to see the recession and has no real plan to jump-start the recovery. He can be pushy and a sore loser, the last thing Tallahassee needs. And he has shown a secretive streak in his public and private business that raises questions about his ethics and judgment. Ambler has embraced the party line too often. But with few policy differences between the two, the choice boils down to who is most capable of moving the district and state forward. This Hills- borough-Pasco district, which includes Carrollwood, Lutz, Land O' Lakes and Dade City, needs a senator who can hit the ground running and compete for the region's fair share of resources. In the Republican primary for Senate District 12, the Times recommends Kevin Ambler. Welcome to my campaign website. Watch this short video to learn more about me, what I stand for, and why I am the right choice. 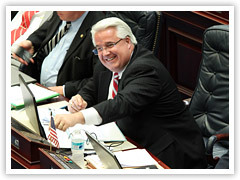 Please vote Kevin Ambler for Florida Senate, District 12 in the Republican Primary Election on August 24th. Watch this 30-second video to see examples of legislation that I have successfully passed into law. These examples demonstrate my commitment to doing what's right while representing you in Tallahassee. As Chairman of the Public Safety & Domestic Security Policy Committee in the Florida House, Rep. Ambler discusses his responsibility to protect Florida by putting forth these important Immigration Reform Bills and explains his common-sense approach to this serious problem. State Representative Kevin Ambler, who has proposed three important Immigration Reform Bills for the State of Florida, discusses the latest ruling in Arizona and explains why his Florida Immigration Reform Bills are constitutional. Rep. Ambler promises to move forward with plans to introduce and pass these bills in the upcoming Special Legislative Session in September. It has been my honor and privilege to serve as your elected State Representative in the Florida House of Representatives over the past 8 years. There are many accomplishments that I am proud of since I first took office in 2002. As a proven fiscal conservative I have continually fought to cut your property taxes and lower your property insurance rates. Clearly, we have made real progress, but there is still much more that needs be done. I have made education a top priority by protecting bright futures scholarships for our children and raising the amount of money we pay classroom teachers. I have fought to improve the quality of health care and to make health care more accessible for everyone. I have made the penalties tougher on criminals who commit crimes against our children. I have helped to substantially improve the benefits available to our veterans who deserve our respect and support. I have worked hard every day to continue to make Florida a better place to call home. As you may know, I am seeking election as your State Senator for District 12 in 2010. While I have accomplished much while serving as your State Representative, there is still much that needs to be done. I believe I have the experience that matters with proven results that will best represent our community in Tallahassee and ensure that we can continue to get things done. With your support, I know we can make government work better for you. As the true Conservative Republican in this race, I will continue to be your conservative voice in Tallahassee. I know we can continue to be fiscally responsible and give support to those who truly need it. I am looking forward to the upcoming campaign. Just as I look forward to representing you again and fighting for those issues which you and I find most important.